This is a new IU basketball series that will focus on a specific date in Hoosier hardwood history. In addition to game notes, important facts, and highlighted pieces of IU memorabilia, there will also be a focus on pop culture facts (music, movies, TV), other sporting highlights, as well as U.S. and world events. Inspiration for this series comes from the “Random Box Score” series from soxmachine.com. Top tunes on the chart for early 1976 included “Love Rollercoaster” by the Ohio Players, “Saturday Night” by the Bay City Rollers, and “I Write The Songs” by Barry Manilow. Theater-goers enjoyed the latest Stanley Kubrick flick “Barry Lyndon,” as well as the Clint Eastwood western classic “The Outlaw Josey Wales”. Notable U.S. headlines for January 1976 included a victory in the Iowa Caucus for future U.S. President, Jimmy Carter. Famed British crime novelist Agatha Christie would pass away at the age of 85. The Pittsburgh Steelers would be victorious in Super Bow X over the Dallas Cowboys, their second straight Super Bowl victory. 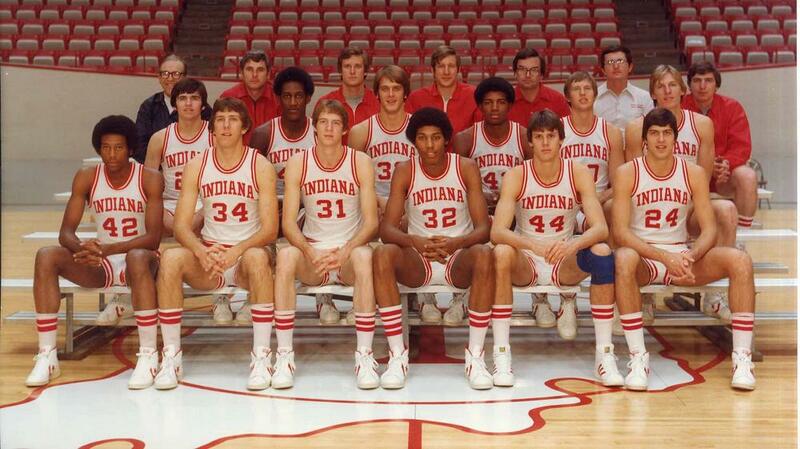 The Hoosiers of 1975-76. 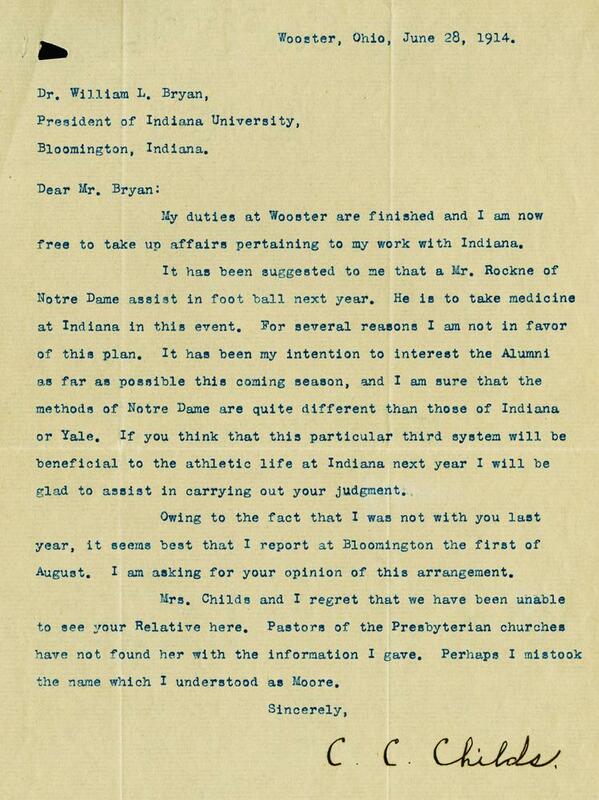 Photo: courtesy of Indiana University Archives. 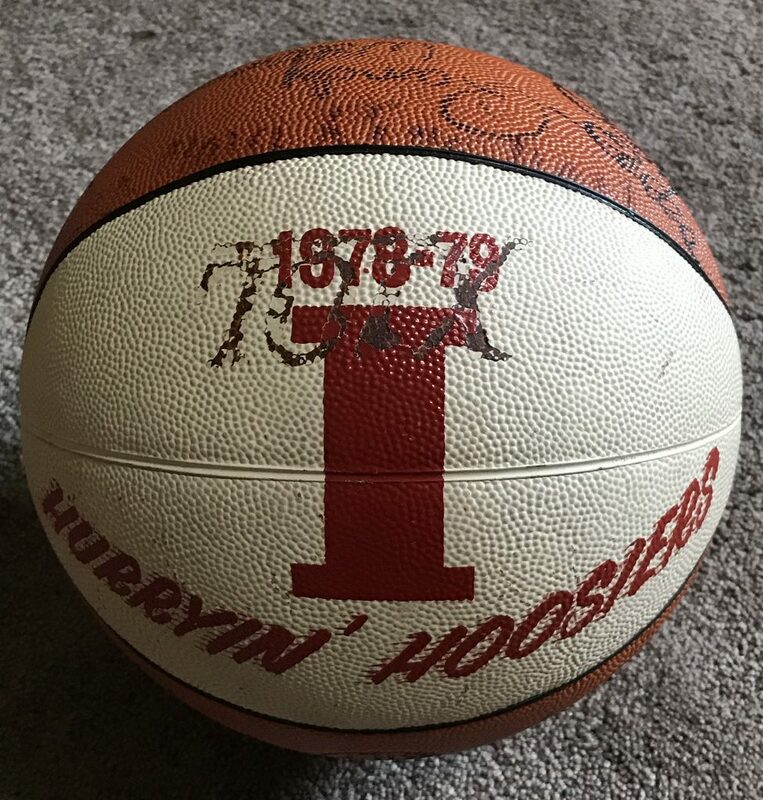 Following a crushing loss to Kentucky in the 1975 NCAA Tournament, the Hoosiers entered the 1975-76 season with one goal in mind: a perfect season. Even with the departures of seniors John Laskowski and Steve Green, a core group of roster talent led many to believe that a special season awaited. Coach Bob Knight prepared a challenge for his Hoosier squad right out of the gate: a face off against defending NCAA champion UCLA in the season opener. The Hoosiers would throttle the Bruins in St. Louis by 20 points and remained unscathed during the pre-conference season. 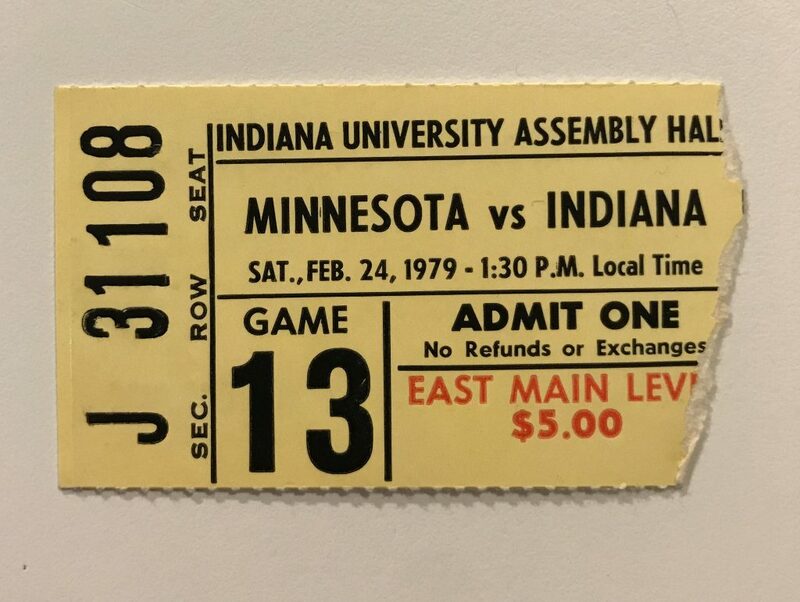 Indiana had gone an unprecedented 18-0 a season prior in conference play, and got off to a unblemished start during the 1976 Big Ten Conference season winning their first eight conference games. As a home game (the first of three straight) against Wisconsin loomed on January 31st, the Hoosiers were ranked #1 in the country and a perfect 17-0 overall. 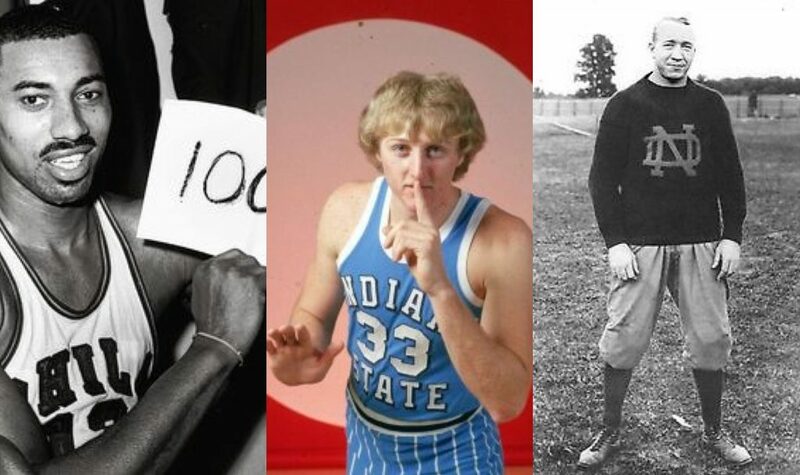 Still, Bob Knight would not let his Hoosier squad overlook any opponent, regardless of record. Wisconsin, a team who had found itself in the middle or toward the bottom of the Big Ten standings in each of the last ten seasons, had come off a tough 8-18 overall season in 1974-75, finishing 8th in the conference. Entering the 1976 Big Ten conference season, questions remain as head coach John Powless looked over his young Badger squad. As Wisconsin prepared for a showdown in Bloomington, the Badgers were hoping to snap a six-game conference skid. 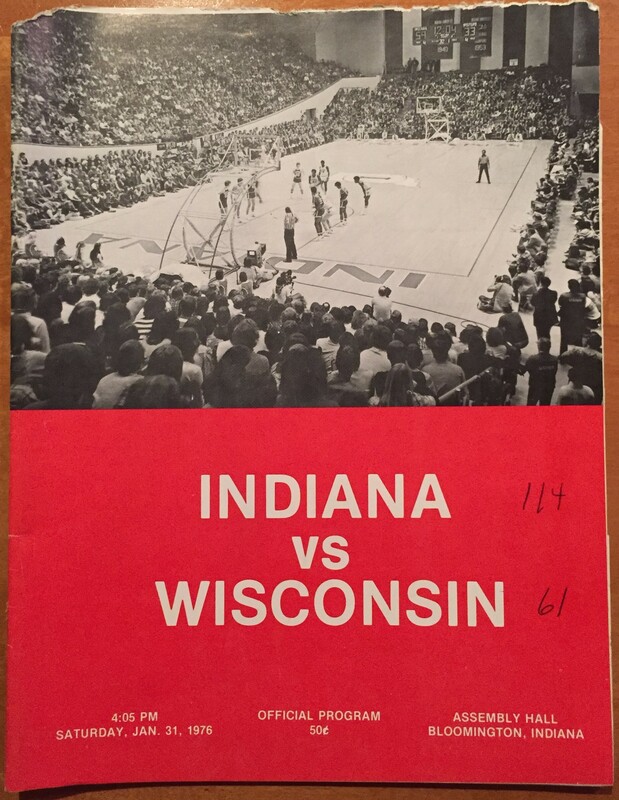 Program from the 1976 Indiana-Wisconsin contest. Indiana was the heavy favorite on a cold Saturday night as Wisconsin entered a raucous Assembly Hall for a Big Ten showdown. Even though Indiana had not dominated conference opponents like a year earlier, the Hoosiers were taking care of business in conference play. However, the Hoosiers looked out of sync from the start, going a cold 0-5 from the field. A Scott May jumper put the Hoosiers on the board after more than three minutes. Despite Indiana’s misses from the field, Wisconsin had an even harder time shaking Indiana’s tough man-to-man defense for easy access to the basket. In fact, the Badgers would not score until after an astonishing 11 minutes. Once the Hoosiers’ shots began to fall, IU was off and running. Shots falling by 6’7″ guard Bobby Wilkerson and forward Tom Abernethy stretched Indiana’s lead to 14-4 against Wisconsin’s unique 1-3-1 defense. 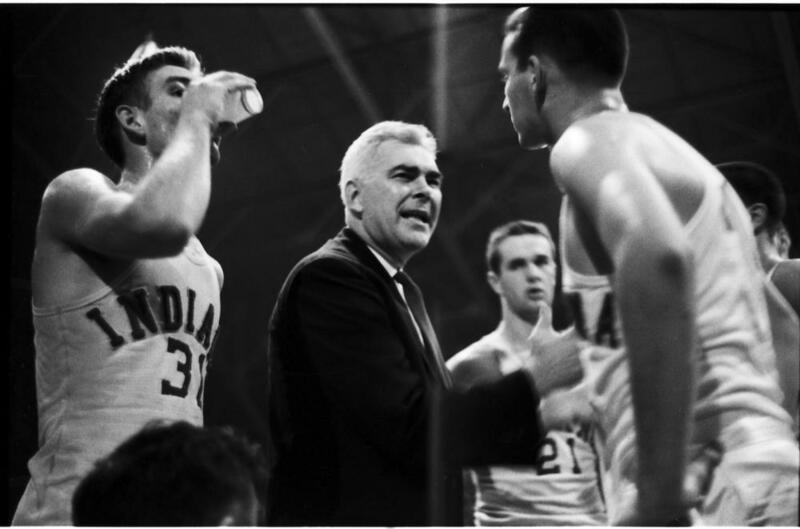 Once it became fairly clear that the more dominant Hoosier squad would be able to take care of business, coach Bob Knight began going to his bench. By halftime, with the Hoosiers on top 62-30, nine Hoosiers were in the stat book with points. 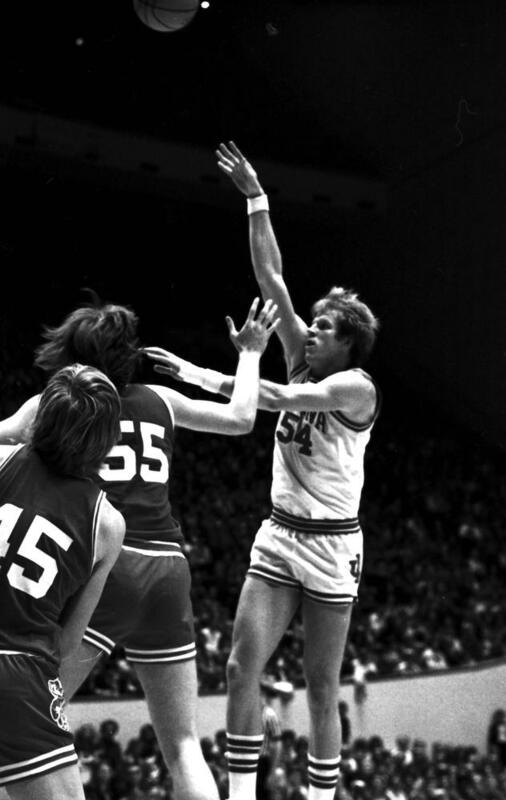 Indiana’s Kent Benson delivers a hook shot over Wisconsin defenders. 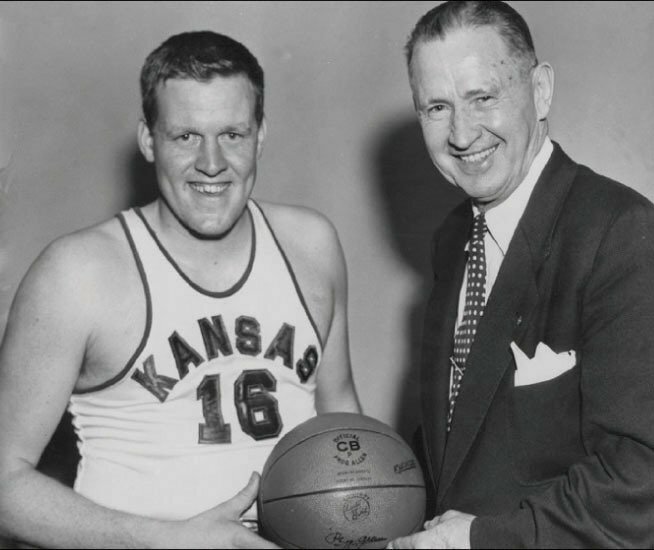 Photo: courtesy of Indiana University Archives. The second half would not be much better for Wisconsin as the Indiana lead began to balloon even larger. Indiana’s depth and talent simply over-powered the young Badgers. 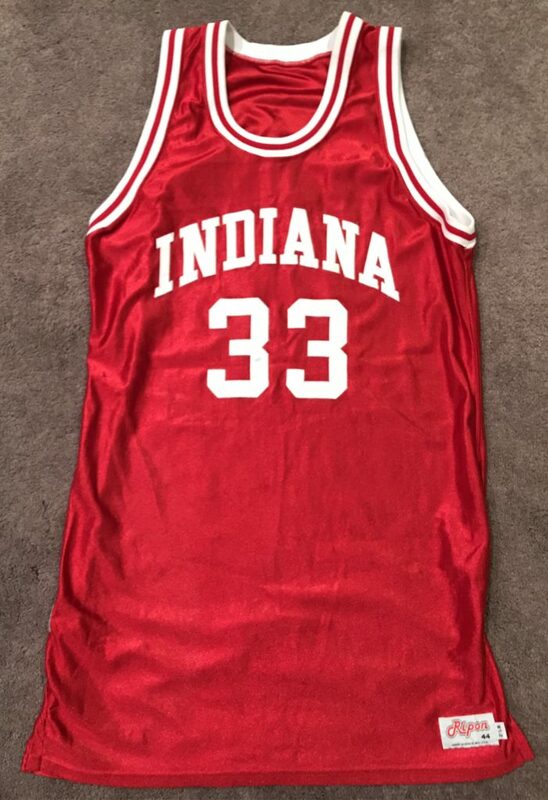 Indiana’s only real blemish would come in the second half, and not by a Hoosier player. Coach Knight would overwhelmingly disagree with a foul call against senior guard Quinn Buckner, and made his case … perhaps a little too overpoweringly. Knight was hit with two technical fouls (no ejection), but it did little to boost momentum for Wisconsin. Indiana’s lead increased to an eye-opening 41 points, 80-39, with more than 13 minutes left in the game. At that point, Indiana starters would be pulled for good. It would be one of the few times during Big Ten play that all 13 Hoosiers would see floor time. 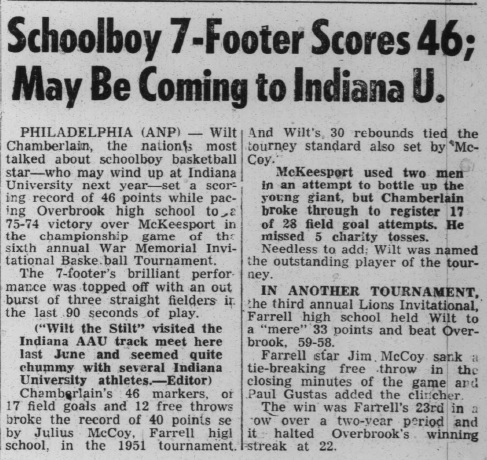 In fact, only one Hoosier (Jim Crews) would not score during the Wisconsin game. When it was all said and done, Indiana had put on a clinic, defeating over-powered Badgers, 114-61. Senior Scott May would lead four Hoosier double-figure scorers with 30, followed by 23 points from junior center Kent Benson. 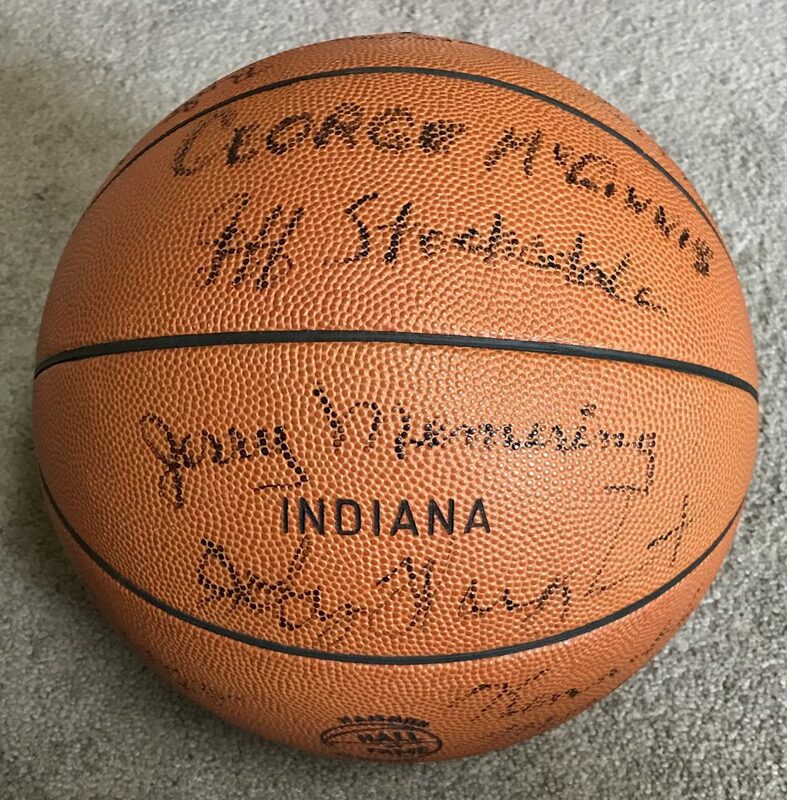 The Indiana victory would clinch new records for the storied program: the 114 points scored would be a then Assembly Hall record, and Indiana’s 28th straight conference victory would be a new Big Ten conference record (breaking the record of 27 straight victories by the Ohio State teams from 1960-62). The conclusion of Indiana’s 1975-76 is one that has been stated countless times but is worth repeating. Despite close calls in conference play, including an overtime thriller against Michigan and two close games against in-state rival Purdue, Indiana entered the NCAA Tournament a perfect 27-0. Their two consecutive undefeated conference seasons remain a Big Ten record. In post-season play, Indiana would find itself Philadelphia facing a familiar foe in the title game: Michigan. Indiana’s third contest against the Wolverines proved to be the most lop-sided, as Indiana would run away with a 86-68 victory, Indiana’s third NCAA title and a perfect season at 32-0. Following the blowout loss at Indiana, Wisconsin’s season would not be much brighter. The defeat would be their seventh straight in conference play, and the Badgers would go on to lose 14-straight Big Ten games before final snapping the streak with a victory against Ohio State. Wisconsin would win their final game of the season against Michigan State, finishing 10-16 overall, 4-14 in conference play (9th place). Following a second-straight losing season, John Powless would be let go as head coach. 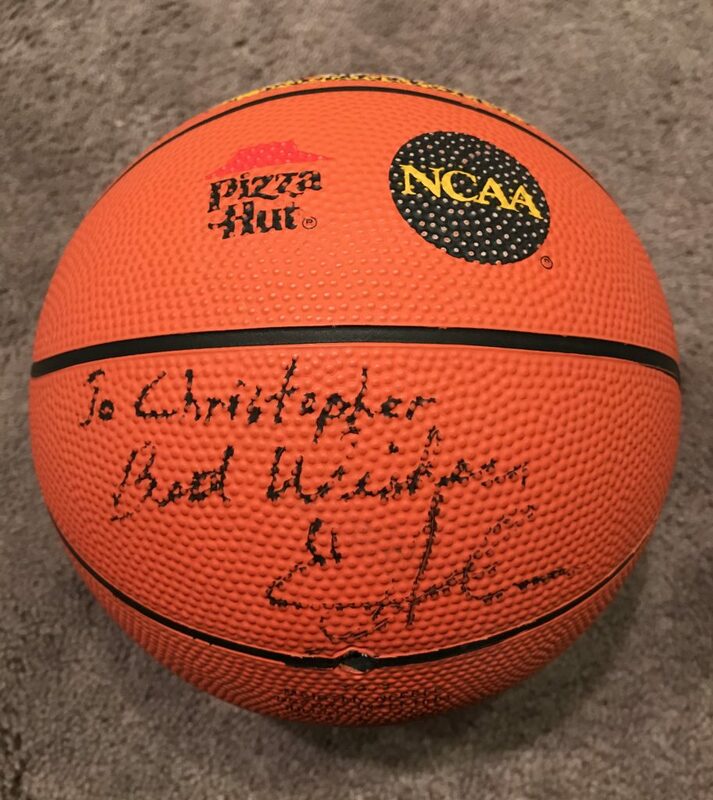 An interesting note: John Powless, who replaced John Erickson (Powless was an assistant under Erickson) as Wisconsin head coach, was hired after Bob Knight, the then head coach at Army, declined the Badger head coaching job offer. Resources: sports-reference.com, Indy Star IU Basketball database, Bloomington Herald Times, Wisconsin basketball media guide. 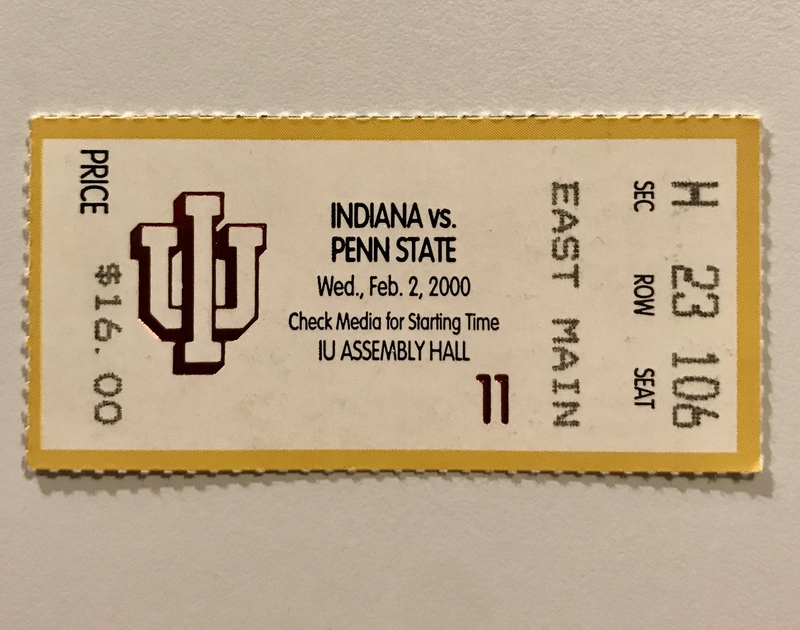 Penn State (12-6 overall, 4-3 in Big Ten play) at Indiana (15-3 overall, 5-2 in Big Ten play), February 2, 2000. Assembly Hall, Bloomington, Indiana. Tops of the music charts in early 2000 included “I Knew I Loved You” by Savage Garden and “What a Girl Wants’ by Christina Aguilera. Additionally, Carlos Santana’s album “Supernatural” seemed to be the most overplayed of any album in history. I seem to recall as a junior in high school in 2000 that music was flat-out awful. Theater-goers could view Boondock Saints, Next Friday, or Disney’s revamped version of its classic with Fantasia 2000. In the sports world, Kurt Warner, who began the season as a backup to former Indiana QB Trent Green (lost to a knee injury), led the St. Louis Rams to the title in Super Bowl XXXIV. A few weeks after the IU-Penn State game, Microsoft would release Windows 2000. On February 13, the final original strip of the classic comic Peanuts is published, one day following the death of creator Charles Schultz. Indiana’s 1999-2000 season outlook began in many ways the same as the previous five: uncertainty. 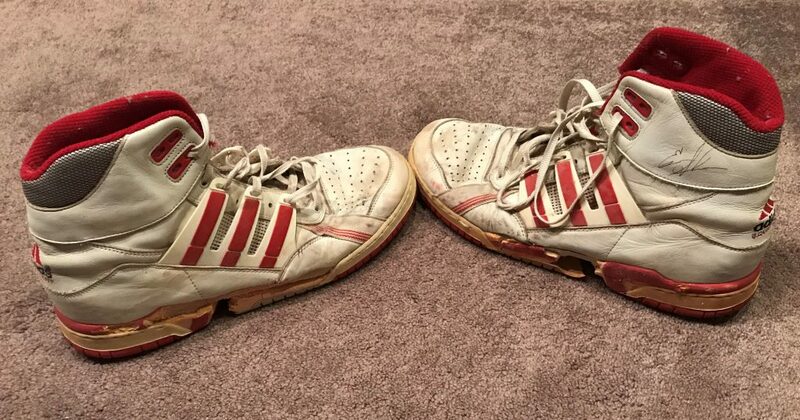 Gone were the days of the early 1990s when Indiana was dependable to produce consistent, high-quality seasons with success in both conference and post-season play. Indiana had made a first-round exit in the NCAA Tournament in four of the previous five seasons, and had not won a Big Ten title since 1993. 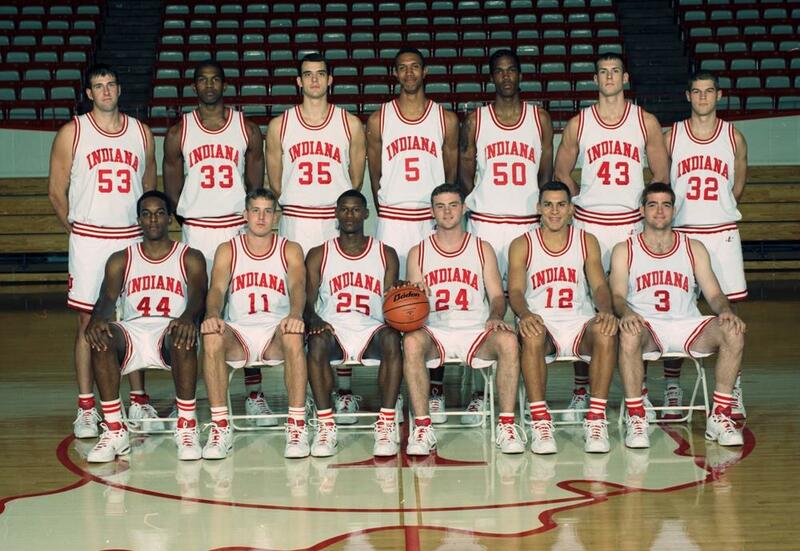 Indiana’s 1999-2000 squad had gotten off to a strong pre-conference season start, the only blemish coming from Indiana State in the Indiana Classic (the Hoosiers would lose the host event for the first time in its 26-year existence). Indiana stood 5-2 in Big Ten conference play, with losses to eventual NCAA Champion Michigan State and Purdue. Penn State had struggled to a 13-14 record overall during Jerry Dunn’s fourth season in Happy Valley. Fans were hoping that Joe Crispin would build on his solid sophomore season to emerge as a leader for the young Nittany Lions. Additionally, senior Jarrett Stephens was proving to be a force down low during non-conference play in the 1999-2000 season. Penn State entered the contest against the Hoosiers winners of four of their last five games. Stephens, the Big Ten’s second leading scorer, had gone for 14 points and 14 rebounds in a loss to the Hoosiers on January 8th. Entering the contest, Indiana’s size was looked upon as a major obstacle for the smaller Nittany Lions. 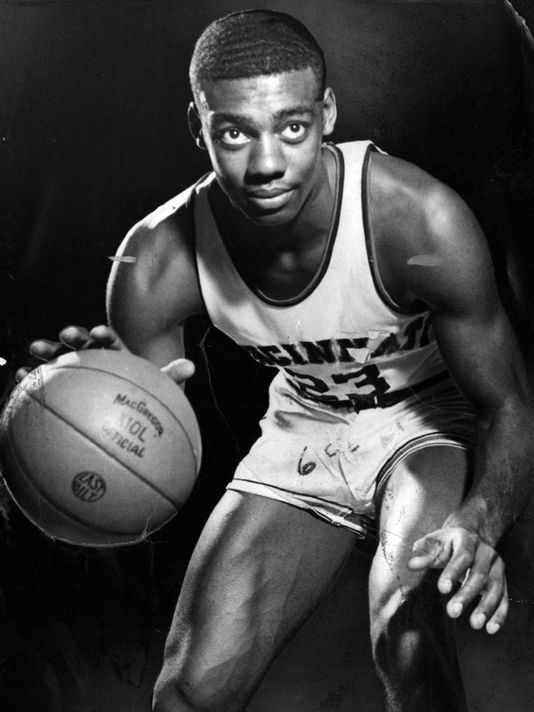 Penn State coach Jerry Dunn inserted 6’8″ Tyler Smith as part of the game plan to deny Indiana the ball down low to center Kirk Haston. Penn State would lead early at 8-3, but soon, Indiana would be on a 14-2 run as Haston began getting hot down low. With guard A.J. Guyton knocking down a three-pointer, Indiana would take its first lead 10-8 with under 16 minutes in the first half. A Larry Richardson game used road jersey, worn during the 1999-2000 season. 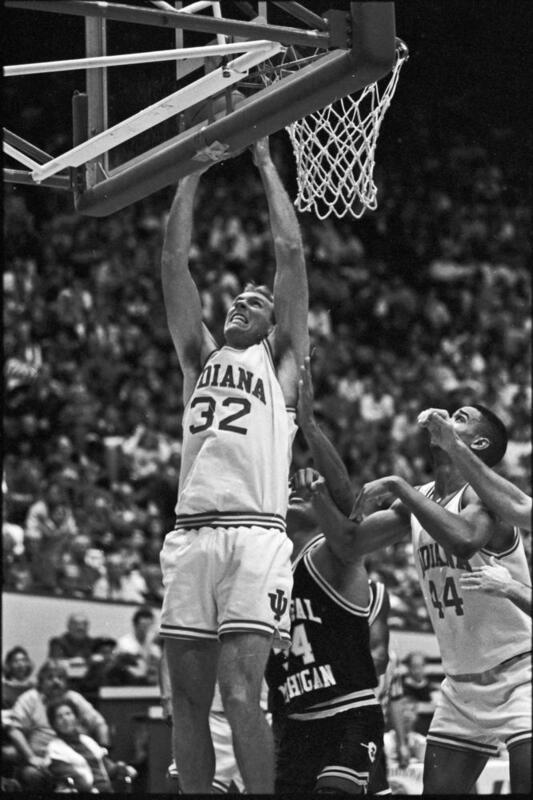 Richardson, who was given the unwanted nickname “Scary Larry” for his often inconsistent play, came out of nowhere to go 6-6 from the field and 2-2 from the foul line in the first half, as Indiana would lead 39-26 at the break. Despite the 13-point lead, Penn State made it clear that they would not back down. Penn State’s unwillingness to give up was evident in the fact that the Hoosier lead dropped to just six points at the 15:23 mark. Titus Ivory, a normal three-point threat for the Nittany Lions, would knock down Penn State’s first three pointer of the game early in the second half, one of his five for the game. But after every run by Penn State, Indiana would respond with one of its own. IU’s 13-6 run, with A.J. Guyton accounting for six of those points, kept the Indiana cushion in place. Larry Richardson found his groove in the second half and the buckets continued to drop. Most in Assembly Hall could not believe their eyes at the performance from the Orange Park, FL product, who had mainly been a role player during his IU career. Richardson would go for a career high 25 points and nine rebounds on a night where a slowed-down, more-focused Richardson was on the floor. It would be a big game for the IU bigs in general as center Kirk Haston would add 25 points of his own in the 87-77 victory. 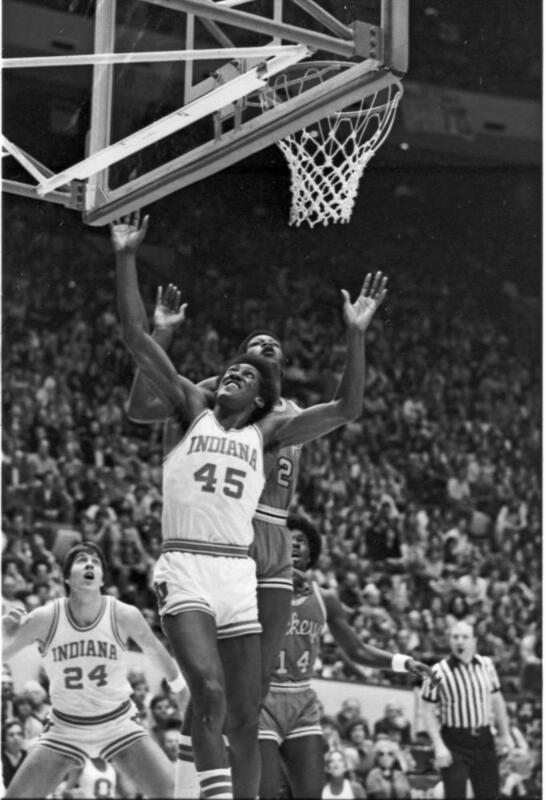 Larry Richardson’s performance on McCracken Court was so appreciated by the IU faithful that a chant of “Larry, Larry” filled the crowd in the closing seconds of the game. The Indiana victory pushed their conference record to 6-2 overall with their next three contests on the road. Penn State’s loss would drop them to 4-4 in Big Ten play. 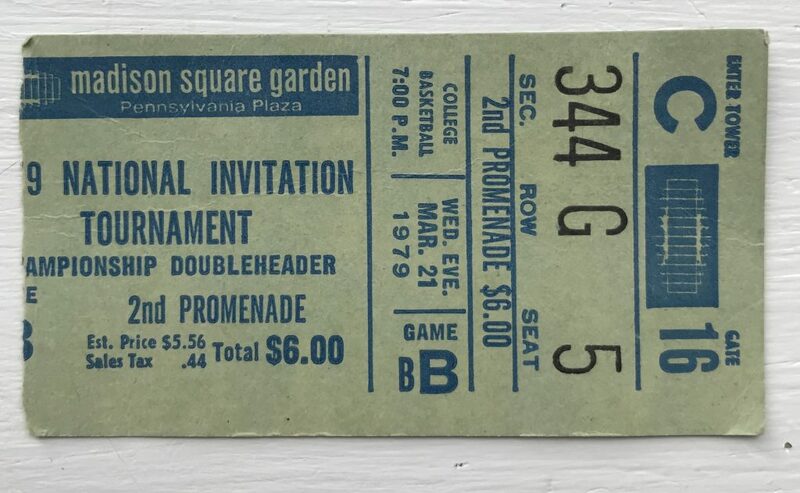 A game ticket from the Indiana-Penn State contest. Penn State’s effort in their second matchup against Indiana demostrated the fire and effort that the Nittany Lions were capable of showing. However, in this case, effort would not equate to much success for the remainder of the Big Ten season. Over the course of their final eight conference games, Penn State would go 1-7, finishing the season at 19-16 overall, 5-11 in the Big Ten. A major upset victory over then 4th-ranked Ohio State salvaged some satisfaction for a season that showed so much promise at times. For Indiana, the remainder of the 2000 season would be a bumpy ride. Over their final eight games in Big Ten conference play, the Hoosiers would struggle to a 4-4 record, finishing 10-6. A quick exit in the Big Ten Tournament (to Illinois), and the Hoosiers found themselves in Buffalo, NY facing Pepperdine as the 6th seed in the East Regional. 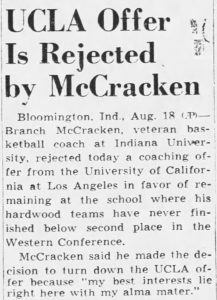 With center Kirk Haston going down with a knee injury two minutes into the game, Indiana was never able to recover, losing to the Waves 77-57. 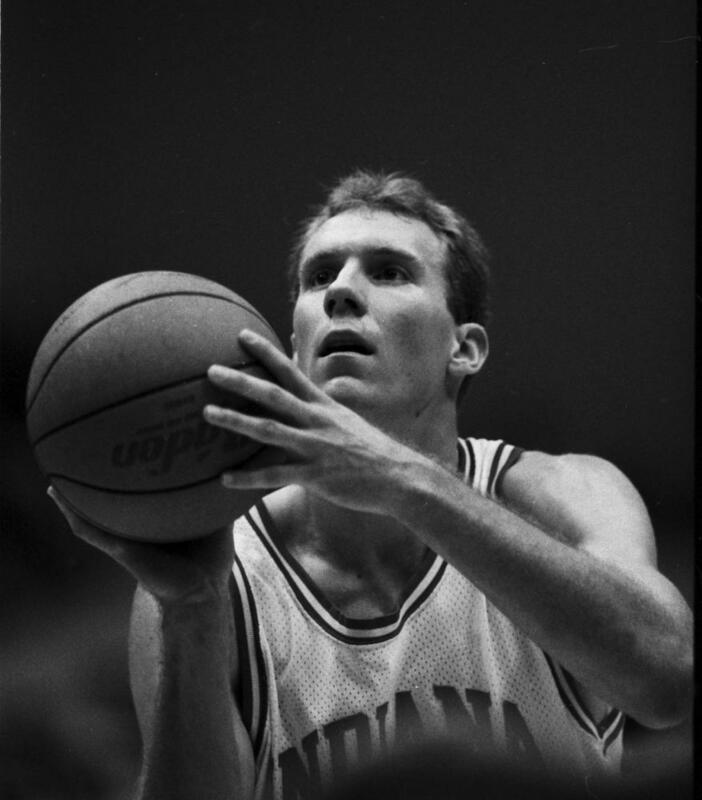 The month of March would not be kind to the Indiana program in general as Neil Reed, a former guard for the Hoosiers, accused Bob Knight of choking him during a practice in 1997. After a video surfaced showing evidence of Reed’s claim, Knight’s status as Indiana coach was uncertain. Knight would be placed under a zero-tolerance policy by IU president, Myles Brand. 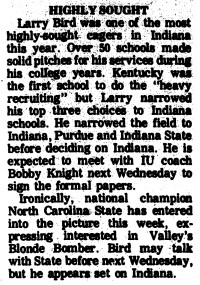 Following an incident with an IU student in September of 2000, Bob Knight’s tenure as Indiana coach, 29 years in total, would come to an end. 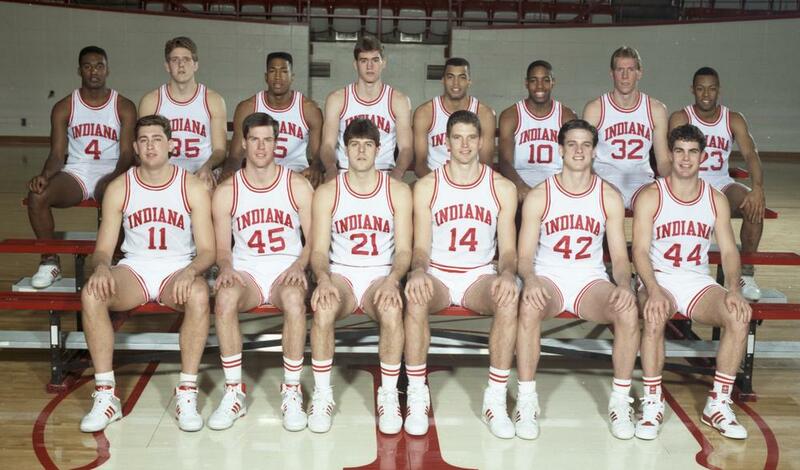 For the first time since 1971, a new coach would be lurking the sidelines of Assembly Hall. Resources: sports-reference.com, Indy Star IU Basketball database, Bloomington Herald Times.